While expensive they last forever and transcend from a bright copper color to a bright blue/green patina given time and the right conditions. You can stall the natural process by spraying them with clear lacquer. This works for a while but without periodic maintenance the natural aging process soon takes over. No one seems to like the middle black stage so to hurry the process to the Green Verde' stage (like the Statue of Liberty) we can carefully spray or wipe the liners with muratic acid or household vinegar several times while keeping them in the bright sun for a couple days to hyperspace your liner to beautiful Verde' color. For your protection the edges of the box are rolled down to minimize the chance of cutting yourself on a sharp edge. (Approximately half the price of Copper) these liners will resist rust much better than plain steel. We haven't figured out how to put a good Verde color on them yet however we can powder coat them in a bright copper color or an antique bronze. 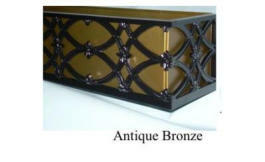 The powder coating gives them extra rust protection and gives the appearance of real copper or brass. Of course we can also powder coat them in White or Black. For your protection the edges of the box are rolled down to minimize the chance of cutting yourself on a sharp edge. We use 26 gauge for smaller boxes and 24 gauge for the big ones. 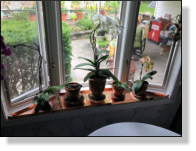 Lisa Torre-Lewis had us make an interesting alteration to our window box liners to use them directly on her home. We added a steel bar to the inside of the liner and punched mounting holes in the bar and liner so her husband could mount them directly on the wall. We are in the process of adding them to the product line. To order call or send us an e-mail and we will send you an invoice. This innovation adds $3.50 per foot (based on the width measurement) to the price of our regular liners. 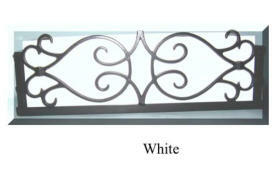 We can supply any liner you choose to perfectly fit your window box. 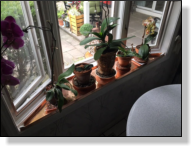 The question sometimes arises, "Should I plant my flowers in the liner then move them to my window box? The answer is no!! The copper and tin boxes expand once filed with dirt making it difficult to fit back into the liner. In addition they could buckle in the middle if it is a long liner filled with heavy moist dirt. The window box is the skeleton for the liner. We are frequently asked, "Why Copper?" The reasons are many. The market is saturated with garden structures and furniture made of wood, plastic, steel, iron, chrome, etc. Copper designs are unique. This beautiful metal has been used for centuries in home decor as accessories and kitchen ware and in home construction as roofing, gutters and plumbing -- proving its durability. Copper makes even more sense outdoors. Whereas wood will weather and crack, and plastic becomes brittle, copper ages to a beautiful green verdigris patina (just like the Statue of Liberty!). The green patina is not like rust on steel, but acts to protect the copper while adding a feeling of quality and antiquity to its' surroundings. City air oxidizes copper more quickly, while the purer county air lets copper take its time going through the patina process. No two pieces evolve alike. 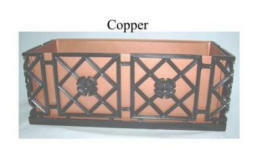 The beauty, strength and durability of copper make it the perfect choice for patio and garden furniture, window boxes and yard art. Copper is also used to repel slugs from plants, an added benefit to using one of our products in your landscape. Sorry for the price increase but.. copper keeps climbing in price.